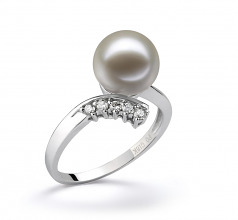 The allure of the Freshwater White Pearl 14K White Gold Ring shows through in this 9-10mm AAAA Quality. The style and matter of fact point makes this fashion style all but a final matter with its 5 diamonds (.09ct) driving home the final choice. 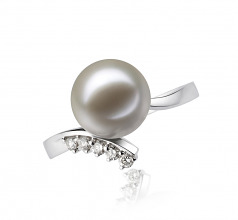 The 9-10mm White Pearl sits atop in all its glory. The (AAAA) shape showing its perfect side of victory and class while the mirror like (AAAA) luster takes its surface to new and shimmering heights. 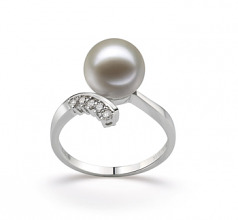 The large White 9-10mm AAAA Quality Freshwater 14K White Gold Pearl Ring is a piece that can make a high profile business or formal statement with its mere presence. Words only become a formality when spoken but can also be effective with just a look.